Sorry, no longer available. The first 250,000 who register as fans at The Chick-fil-A Chicken Wave website will receive a coupon by mail for a free chicken sandwich. Thanks goes to Tomorrow’s Plight for letting me know about this awesome promotion! After the first 250,000 fans sign-up, then the next 750,000 get a coupon for a free Coke. 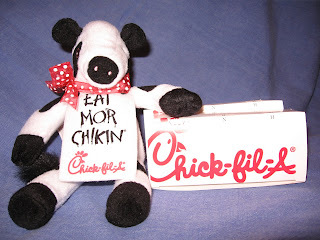 They are also promoting their Chick-fil-A Labor Day Giveaway on Monday, September 7 starting at 10:30 am where everyone wearing a sports team logo gets a free chicken sandwich. I got me and the hubby signed up. Too Bad you have to be 18 or older. I would have signed up my 6 children too.